Many Bendites are dog lovers! We are so blessed to live in a town that embraces this love affair. Travel downtown, the Old Mill, or most parks to see water bowls available and doggy treats passed out by local business owners. 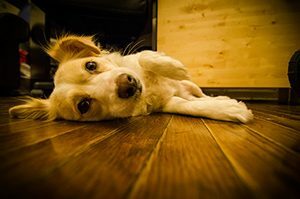 However, dogs can be problematic when it comes to flooring our homes. Cinders, dusty C.O. dirt, and tumbleweeds stuck between paw pads, plus sharp claws, can excoriate your floors in less time then it takes to reheat your latte in the microwave. 1.) Porcelain tile. Today porcelain tile comes in a myriad of colors, sizes, prices and styles. If you are sold on a wood look, check out some of the new plank tiles that are meant to look like wood. “There is a wood look for everybody” ~M. McDevitt Cons: Porcelain tile can be cold without an in-floor heating system. 2.) Stone tile. Travertine, granite, and slate can be pet friendly. These materials need more maintenance than porcelain and will “patina” over time. Natural stone is porous and will need periodic sealing to protect from those times when the doggy door is frozen shut. Cons: softest stones like limestone and marble, may not perform as well. 3.) Laminate. Though not as pricey and “natural” looking as wood, laminate can be a good option. Cons: accidents need to be cleaned up quickly as this choice can warp if left wet for too long. 4.) Luxury Vinyl Tile. The new vinyls aren’t the same as they were in 1973. They have a lot more dimension and come in some interesting patterns. Cons: LVT is not seamless. 5.) Marmoleum, is no longer you grandma’s linoleum. It may me made the same way, but today it comes in a rainbow of colors and is sustainable. Cons: the lighter colors may stain but it still is a great option for homes with pets. Visit our showroom to create a dog-friendly floor. We will find a perfect floor for you and your furry friend(s).